We are using chemical and biological tools to study ferroptosis, a form of regulated cell death discovered in the Stockwell Lab. Ferroptosis is an iron-dependent form of oxidative, non-apoptotic cell death that is tightly linked to metabolism and disease. We are exploring how ferroptosis in triggered during normal physiological processes and in disease states, and how it can be induced and inhibited for therapeutic benefit in various cancers and neurodegenerative diseases. 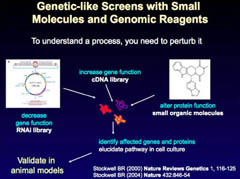 We use synthetic organic chemistry and computational chemistry tools to design chemical probes and drug candidates that reveal cellular and molecular mechanisms. 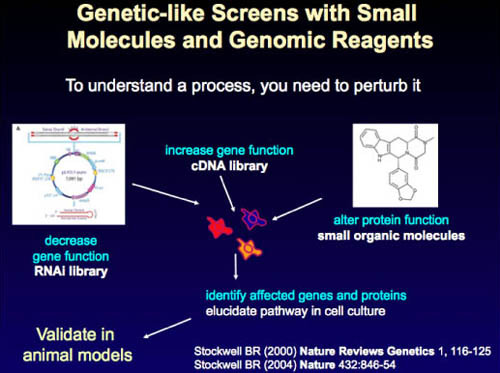 We also use metabolomics, lipidomics, mass spectrometry imaging, CRISPR and siRNA/shRNA screening, protein expression and biochemistry, structure elucidation and animal models of disease to explore these questions.